[Only for 2017] Ok, time to reach the halfway point of our travels through the new Haagen-Daz Destination Series. I think it could be argued that this flavor is the most foreign of the line up... see what I did there? No, not funny? Oh it was a little funny, I mean, my only sesame experience as a child was either sesame seeds on my hamburger bun or sesame street, and I don't think that second one applies here. 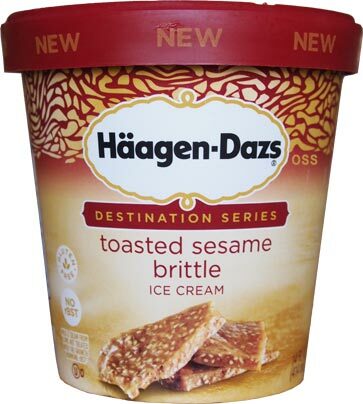 The biggest question on this flavor seems to be "what is toasted sesame brittle?". Have I had it specifically? I'm not positive, though I think I may have had something similar. To jump right in to it, let me just say that I like this flavor. 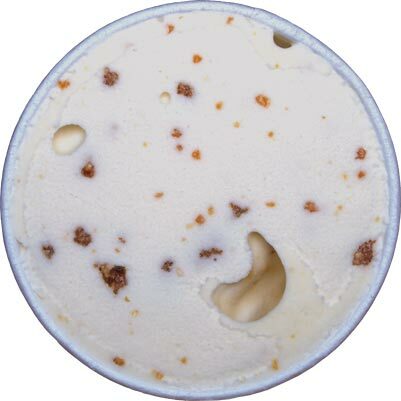 There is a sweetness to it and you may get a thought of crunch and munch or other caramel popcorn treat here and then. Add that in to the excellent quality and flavored base and it made for a nice afternoon snack that I could have easily inhaled. Should this flavor scare you? Maybe. There is that bird feeder like quality to it but it only gets a little weird if you have too much of the brittle on your spoon (yes, that's actually a problem here). When you get a big chunk (or two), there's almost a burnt quality to the brittle. Please don't think I mean literally burnt, there's just that complexity to the sesame factor here. I'm guessing you will find this one oddly familiar. Whether you remember having sesame products or not, you will remeber the flavor once you've had it. Do I recommend this one? Ofcourse, unless you have a think against sesame seed. Like I said, there is a really nice sweetness to it. Not a straight up sugar sweetness, but one that goes oh so very well with the texture of an premium all natural ice cream. Fun times indeed. On Second Scoop: dear blogger, where did the second scoop I typed out last night go? Uggg. What I pointed out was that when I mention a kind of cracker jack vibe to it, that also implies a bit of peanut vibe to the flavor as well (as crackerjack has peanuts). To put it another way, if you've ever had sunbutter or some other toasted seed spread, the flavor is kind of reminiscent of that as well. It's a top notch texture, it's got a fun sweetness to it, it's got plenty of bits, and it's unique. If you need something different in the freezer, don't be afraid to give this a shot. I think this is the best flavor is the destination series. I've already repurchased it and will do so again and again. I love it ... So much so that I have purchased sesame seed brittle and sesame seed sticks to snack on. It made me realize that sesame is a fabulous flavor. Thanks for the review Dubba. I'm slightly terrified of this flavor, but picked it up when I saw it in the store because it's new and creative. I'm def less scared to crack the pint open now! This was very different. Even though I'm not a huge sesame fan, the concept of this flavor was so intriguing that I had to try it. This was a quality product that very much reminded me of toasted sesame sticks, although the texture of the brittle was stickier than I expected (not Butterfinger stuck on the roof of my mouth stickiness, but more than I expected). Despite delivering on the label (unlike the skimpy Brownies in Brownies a la Mode), I don't think my brain could really comprehend this texture in this format and attribute that to not planning on buying this flavor again more so than not being the biggest toasted sesame fan. I don't have a great comparison, as my first thought would be comparing it to eating a hearty soup in ice cube form (obviously, the ice cube could melt into cold soup), simultaneously tasting a vegetable and some meat and the coldness of this ice cube on your tongue and the crunchiness on your teeth. I do not regret my purchase and would agree that it is worth a try if you like toasted sesame and/or something different. Still have yet to locate this flavor. I like how this is the kind of flavor where even after reading your review, I still don't know lol. Finally found this at a Super Wal-Mart! I was surprised how much I loved this ice cream. As far as brittle ice creams go I loved the Jeni's Brown Butter Almond Brittle more, but as far as prices go the Haagen Dazs is definitely more cost effective. I actually love snacking on sesame brittle, so I'm excited to try this when I find it. My favorite departed HD flavor was the macadamia nut brittle so I'm hoping this fills a similar niche. Found this on a special.....bought many flavors..yea the brownies ala mode is skimpy..no chunks of brownies just basically brownie swirl ice cream. But this one is great. this really is. 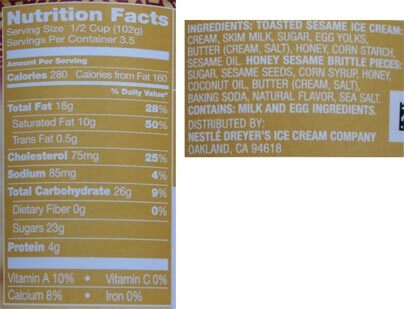 It's basically pieces of sesame snaps in vanilla ice cream. It's a great idea and it's a total win. Other people say they want more but I'd say less is more here for a pallet pleaser. I tried this flavor, too, but I did it because I sorely miss my favorite flavor of all time - one that Haagen Dazs discontinued a few years ago. (How could they do that to me??) Forgive me if this is an inappropriate use of the comments, but I don't know where else to turn. 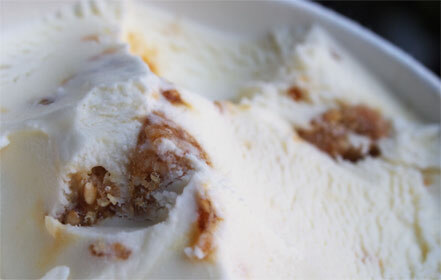 Help me persuade Haagen-Dazs to "Bring back Macadamia Brittle!" I made a facebook page for it. Do a simple search and you will find it. I'm hoping a million likes will earn us our favorite ice cream flavor back on the shelves. So far, I have 64. Will you help? Search for Bring back Macadamia Brittle. Like and share! Good news, this flavor still exists, but a question: do you live in Sweden? or Brazil? There are probably a few other countries too. That said, despite your love for this flavor, deep down this is still a business and that means your beloved Mac brittle just didnt sell well (much like Ben & Jerry's chocolate macadamia or Walgreen's macadamia mashup). The ice cream industry is worth billions, it's nothing personal. If a flavor doesn't turn a profit, they won't continue it, no matter how it might appeal to a certain group. If you are wondering why I seem to be a bit harsh it's because after reviewing your facebook page, you seem to be getting snippy with people because they don't just magically assume you are correct in saying this is "the best flavor ever". It's your favorite flavor that is also enjoyed by others, but that doesn't make it the best. Nothing is truly the best (there will never be universal agreement on anything). I'm sorry for your loss and I wish you the best, but you might want to change your approach a little to help bring in more people. Creativity is the key, not badgering. I live in El Monte, California. Does anyone know where to buy this favor ice cream?